Please see Entry Requirements section below. In 2016, 98% of our students gained employment after completing their degree. We scored 97% on the overall satisfaction score for the National Student Survey. Hone your practice with state-of-the-art imaging equipment. Live and work in a different EU country with our ERASMUS programme. Our many NHS partners provide high quality work experience. From the beginning of your degree in Diagnostic Radiography, you start learning your skills using a range of sophisticated technology in a modern healthcare setting. From of X-rays, Computed Tomography (CT) and Ultrasound to Magnetic Resonance Imaging (MRI) and Nuclear Medicine, you gain the relevant expertise to produce high quality images to diagnose or assess injury or disease. We also support you in building superb interpersonal, technical and problem-solving skills, while you learn about the needs of patients and patient pathways. Work experience is invaluable in a rapidly evolving field. Your placement makes up 60% of your course – between 17-24 weeks each year – and takes place under the supervision of a dedicated practice educator. In your final year, you have the fantastic opportunity to live and work in a Scandinavian country, Portugal, Netherlands, Malta, Ireland or Austria through our ERASMUS European Exchange. The three-month placement is your chance to specialise in an area such as ultrasound, pharmacology, emergency radiography, interventional radiography, or CT and MRI scanning, while enjoying a different country and culture. Apart from Belfast, we are the only UK university to offer this exciting developmental experience. Visit the ERASMUS website to find out more. The course is accredited by The Society of Radiographers and once you have graduated, you are eligible to apply for registration with the Health and Care Professions Council (HCPC) so you can practice professionally. We embed the NHS Constitution Values in everything we do, underpinning the expectations of our staff and students and our practice settings. Go to the Government’s website for the full NHS England Constitution and Values. For more about studying Diagnostic Radiography with us, why not take a moment to listen to our short podcast? In your first year, you learn about the principles and practice of radiography, with lecturer-led activities, guided reading and closely supervised practice. Studying more complex elements in the second year involves reflecting on practice and developing analytical, critical and problem-solving skills. You are given greater autonomy in the third year, with increased responsibility for your own learning and continued professional development. To meet the learning needs of students, we teach using lectures, seminars, group work and practical sessions. We assess using a variety of methods such as examinations, Objective Structured Examinations (OSEs), viva voces, posters, presentations, seminars, practice-based portfolios and practice assessment documents (PADs). This module will provide the student with a sound knowledge base of health care principles which can be applied in the clinical environment to provide safe and effective care. It will introduce and prepare the students to work within the NHS and embody the NHS constitution and values. This module will introduce the student to the physics principles which directly underpin equipment, techniques and procedures during clinical practice. The module will provide an opportunity for the student to develop essential theoretical skills, sufficient knowledge and understanding of radiation biology and physics in order to appreciate the legislative framework for safe work with ionising radiation. This module is designed to give the student an understanding of the anatomy, physiology and pathology of the appendicular skeleton, chest and respiratory system. It will introduce the student to the common radiographic techniques employed in projection radiography, and care of the patient for such examinations. This module will give the student the opportunity to develop an understanding of the anatomy, physiology and pathology of the axial skeleton and abdomen. It will introduce the student to the common radiographic techniques employed in projection radiography, and care of the patient for such examinations. This module will explore the fundamental principles directly underpinning computed radiography (CR) and indirect/direct radiography (DR) equipment within projection radiography. Image acquisition techniques encountered during clinical practice will be explored theoretically providing students with an opportunity to connect theory with practice. This module is designed to give the student an understanding of the anatomy, physiology and pathology of the urinary, reproductive, endocrine and central nervous systems. The module will build upon the student’s understanding of radiographic projection imaging, and introduce a variety of other imaging procedures used to image the urinary, reproductive, endocrine and central nervous systems. Diagnostic radiography is concerned with providing safe and accurate imaging examinations in order to facilitate appropriate treatment and management of service users presenting with a range of increasingly complex conditions. Such examinations encompass a wide range of situations across the life span, including acute and chronic conditions, trauma and health screening. This involves the use of specialised imaging modalities to facilitate diagnosis and expedite treatment. Diagnostic radiographers are required to perform and assist with these procedures. Knowledge of the relevant technology underpinning this equipment is therefore necessary to determine the appropriateness of imaging modalities and practice in a safe and informed manner. This module is designed to give the student an understanding of the anatomy, physiology and pathology of the gastrointestinal, hepatobiliary and cardiovascular systems. The module will build upon the student’s understanding of radiographic projection imaging, and introduce a variety of other imaging procedures used to image the gastrointestinal, hepatobiliary and cardiovascular systems. This module aims to provide the student with an opportunity to evaluate this area of radiography and develop an appreciation of the factors which can enhance its diagnostic efficacy. This module will build on knowledge gained from the level 4 IPL module by continuing to promote awareness of the student’s role in the interprofessional team. It will also enable the student to work towards the critical insights required to succeed in the level 6 IPL module. The student will use critical reflection, analysis of the service user journey and promotion of multi-agency working across health and social care teams to enhance the care that they provide to service users. The development of research skills is an essential requirement for all graduates. This module is designed to build on the principles of evidence-based practice that have been introduced at level 4 and prepare students to make informed choices regarding their approach to a research project to be undertaken at level 6. This module aims to provide a broad knowledge of “developing” imaging to allow an appreciation of safe and appropriate use of such technologies, procedures and examinations in the clinical setting. Students will select a subject of topical, specialist, medical imaging areas to study in depth. This module provides a learning opportunity for students to develop skills in aspects relevant to image interpretation, clinical reporting and decision making. This encompasses both academic and clinical components and reflects the Society and College of Radiographer’s expectation that undergraduate programmes should include aspects of medical image interpretation and clinical reporting in the curriculum. This module is designed to prepare the students with a portfolio of skills in preparation for their first post as a radiographer. It will afford the students the opportunity to explore a range of professional issues and the wider implications of current government initiatives and policies and to critically reflect on the NHS constitution, principles and values. The research project provides the opportunity for students to develop an individual study drawn from an aspect of radiography. It will enable students to utilise skills developed throughout the course and allow them to apply problem solving and decision making skills in a novel situation. The research project also provides a mechanism for the continuing development of autonomy and self-direction. This module builds on the interprofessional modules at level 4 and level 5. It is designed to prepare students from a variety of professional backgrounds to work within practice in health and social care organisations. Interprofessional working in practice is an essential component of the role of new and established practitioners. The module promotes multi-agency working across health and social care teams. Interprofessional working is promoted through the exploration of topical issues within health and social care. This module will enable the student to select a topic to study in greater depth. 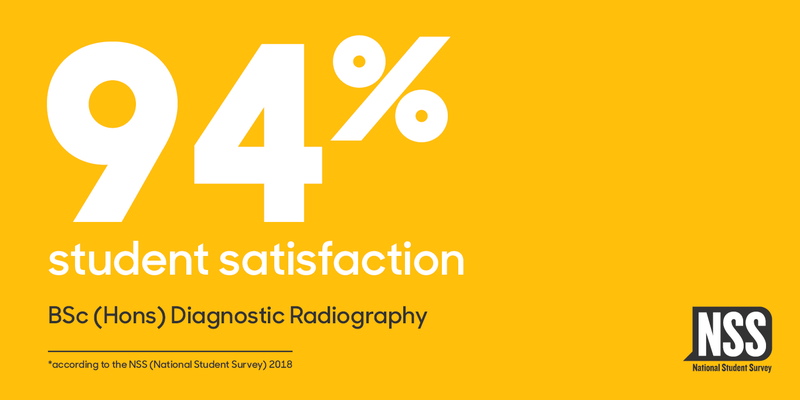 It will enable the student to plan, research and produce a piece of individual study developed from a specialist aspect of radiography practice. In doing so, the student will develop problem solving skills, through gaining experience in the formulation and application of action plans and strategies, and a degree of autonomy in learning. This module is also designed to prepare the students for entry into the profession as a qualified practitioner and to encourage continuing professional development. If you choose this module, it replaces Diagnostic Imaging 9: Advances in Diagnostic Imaging and the Interprofessional Learning: The Professional in the Team. As a specialist degree, we are very proud of our graduates, with the majority going on to careers as diagnostic radiographers. Other students progress to study for postgraduate qualifications in specialist areas so they can become advanced or consultant practitioners. The skills learnt during the course are also transferable, opening up routes to other careers in education, industry and research. There are also opportunities to practice as a radiographer in a range of other countries. Take a look at this career structure for radiography for more inspiration. Applicants whose first language is not English, but who have been living in the UK for 2 years or more will be expected to hold GCSE English at Grade A-C, (grade 4-9 for the new GCSE), or a comparable GCSE equivalent from their home country. The process of selection is two stage: admissions tests (literacy and numeracy) and Multiple Mini Interviews (MMIs). As part of the selection process, you will be expected to demonstrate a good knowledge and clear understanding of the scope of work that a radiographer is required to undertake as well as the significance of the NHS Constitution and values. Your time with on your degree will be split between the Waterfront Building, our innovative Atrium Building, and your hospital placement. The Watefront Building has six floors, one auditorium which seats 200 people, two main lecture theatres each seating 140 people and 34 teaching rooms seating between 18 and 80 people. Every teaching room has state-of-the-art AV equipment enhancing students learning experience and spread across the open study areas there are approximately 50 iMacs. We offer open study on all floors, where students can access networked computers. The Atrium houses the Ipswich Waterfront Innovation Centre (IWIC) and our well-resourced library, which offers extensive print and digital resources, with plenty of study space and pods for extra privacy. Study space is available to all students in the Waterfront Building.